Mega Sale! Save 26% on the Hard Foot Skin Remover File - BEST MEGA Foot File Pedicure Rasp GENUINE MEGAFILE Professional Heel Care Callus Dry Dead Skin Egg Corn Sander Scrubber Pumice Stone Alt Ped Pedi Feet Grater Add on Item by NYK1 at Beauty Sols. MPN: 4325996730. Hurry! Limited time offer. Offer valid only while supplies last. 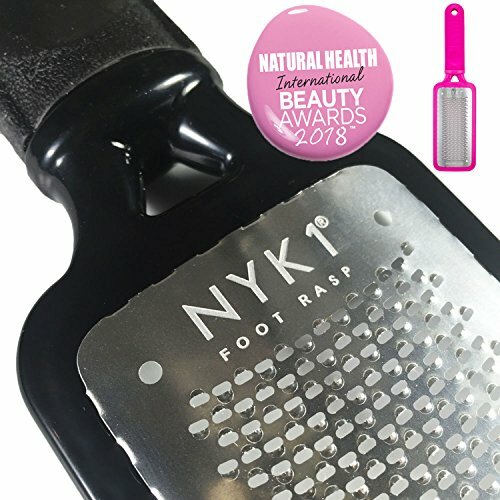 The NYK1 Pedicure Foot File Rasp is here! And now it's in Black (Pink style available).Say Goodbye to tough hardened skin on your feet and heels. View More In Foot Files. The NYK1 Pedicure Foot File Rasp is here! And now it's in Black (Pink style available). Say Goodbye to tough hardened skin on your feet and heels. This strong tool is exactly what you need to instantaneously remove tough and rough skin build-up. Hundreds of perforated grooves are expertly manufactured into the stainless steel plate to be Gentle yet Abrasive on your feet. Follow up with the NYK1 Smoothie to perfect your feet. You will be amazed at the results! ★ A QUALITY PRODUCT AT A GREAT VALUE PRICE - This File has a very large surface area to be able to treat feet fast. Instant elimination of hard, dead callused, rough skin. No need to soak feet prior. Our fastest selling Foot File ever. Perfect for use against uncomfortable dead and hard skin. ★ LARGEST FILING SURFACE - of over 400 tiny bi-directional micro blades quickly remove the toughest of calluses and dry skin in seconds. Super powerful and very strong with no nicks to the skin. No electric needed as electronic items would also need batteries! ★ SIMPLY THE BEST - professional pedicure rasp you will have EVER tried! If you have any questions about this product by NYK1, contact us by completing and submitting the form below. If you are looking for a specif part number, please include it with your message.